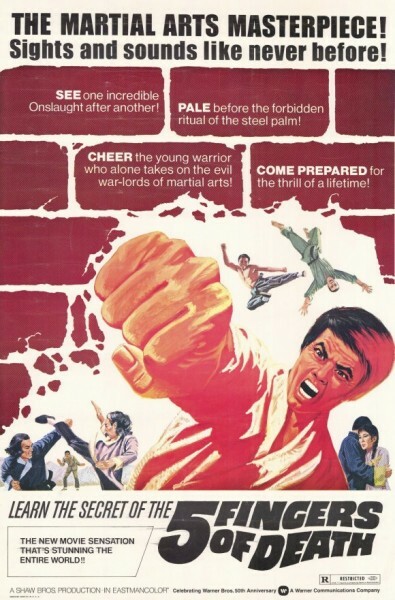 “Five Fingers of Death (1972)” movie review. Plot: As a tournament approaches, Chao Chih-Hao (Lieh Lo) joins a new martial arts school and learns their style, but jealous rivals conspire against him and his Teacher. Also known as “King Boxer“, “5 Fingers of Death” and “Tian xia di yi quan“. I wasn’t sure whether I should refer to this as “King Boxer“, which is the original title, or the Warner Brothers’ dubbed “Five Fingers of Death“, because both names tend to be popular amongst fans. I ultimately chose the latter because I watched the English dubbed version, which began the Kung Fu craze of the 1970’s within the United States. This alone makes “Five Fingers of Death” important, but I’ve seen many genre classics with historic value develop gout over the years- with the Shaw Brothers library in particular being filled with poorly aged ‘masterpieces’. I only bring this up because the subject of this review defies its mortality and holds up incredibly well. “Five Fingers of Death” is filled with intense fight sequences, but also is blessed with an ambitious story and intriguing characters. I only suggest that you try to find a better DVD transfer than I did, as the copy I got from netflix was clearly taken from a VHS tape. I had no difficulty tolerating the crude video quality, but the shoddy audio didn’t get along with my poor hearing. The fight choreography is a little rough around the edges, as characters have the annoying tendency of dropping their guard at pivotal moments and the punches sometimes look clumsy. Yet while not polished, the emotion behind every attack feels genuine. I didn’t see actors performing stunts as much as I saw people trying to hurt each-other. There was murder etched in the characters faces and the choreography is surprisingly fast paced considering how the emphasis is on the brutality. There is quite a bit of violence and the sound effects alone sound painful, but the collateral damage is what will make “Five Fingers of Death” last within your memory. The props and sets are constantly being destroyed by punches, kicks and flying bodies- completing the illusion of authenticity. Now keep in mind that this is the older style of kung fu cinema, which was innovative in the 70’s but might look cheesy by todays standards. I think the kung fu still looks acrobatic and visceral, but there are certainly better examples of the genre. While there are some pacing problems, I was pleased with the quantity of action sequences. There are many duels, brawls, training sessions and attempted assassinations- that’s a lot of kung fu! Chao Chih-Hao (Lieh Lo) is a rather standard hero, whose alleged flaws even seem to work as strengths. However, Lieh Lo does a phenomenal job in the role and reminds me how under-appreciated he was as a leading man. He’s primarily remembered for his work as every villain from the 70’s, but here he does an excellent job at conveying vulnerability and has a dignified presence that compliments any heroic character. He has a variety of facial expressions, which add to his already distinct appearance. He was a damn good actor and manages to bring in his intense glare that typecast him as a villain, even though it fits this context perfectly. The acting overall is pretty good and the character writing is surprisingly strong. The villains have moments of respectability and develop throughout the course of the film, some finding redemption while others become more monstrous as the story progresses. Yet outside of the Japanese characters- because racism- they all are written as human beings. I expected the evil teacher to abuse his son for being reckless, or his son to turn on his cautious Father, but they seem to have a strong relationship. I don’t expect violent thugs to question whether their masters have gone too far either, so that’s nice. My favorite character has to be Han Lung (James Tan), the jealous rival to Chih-Hao. You can tell he will become an antagonist almost immediately and yet it’s hard not to feel kind of bad for him. The way they resolve this character is interesting because it can’t be summed up as either ‘damnation’ or ‘redemption’. The only character I didn’t care for was the dancer, who seemed selfish and insensitive, although these don’t feel like intended character traits. She is a pretty well rounded character, easily being more fleshed out than the static love interest, having a believable personality and more defined goals. But she’s also a wet blanket who stops the film dead in its tracks whenever she shows up. “Five Fingers of Death” might have an interesting cast of characters, but the narrative doesn’t always seem to know how to use them. Characters will vanish for large periods of time and I occasionally even forgot that a few existed- like Chih Hao’s friend, who is prominent in the beginning and the ending but is absent throughout the middle. Characters will die, but the drama is undermined because the reactions are minimal. This is especially apparent during the ending, where two characters are slain, but Chin-Hao never notices. I found myself befuddled by the passage of time, especially while Chin-Hao has to do chores for his new Master. They act like he has been working there for months before being accepted as a student, maybe even a year, but another character mentions that ‘they had a bout a few days ago’…said bout was before Chin-Hao had even met his Master and this line takes place after he has become an official pupil…Maybe that’s a blunder exclusive to the dub? I’m not sure, but I will admit to enjoying all the conspiracies going on. The good guys are focusing on learning new martial arts, intent on improving themselves. The bad guys are focusing on plots and schemes, intent on devaluing their enemies. This is a relatively simple story, but it is told effectively and creatively. I attribute a lot this to the characters being memorable and the writing focusing on their quirks and how their actions drive the story. Plus, it allows a lot of room for kung fu fighting and as I liked said fighting, I can assuredly say that “Five Fingers of Death” is awesome. Oh yeah, I loved the eccentric music, which apparently sampled “Ironside“. 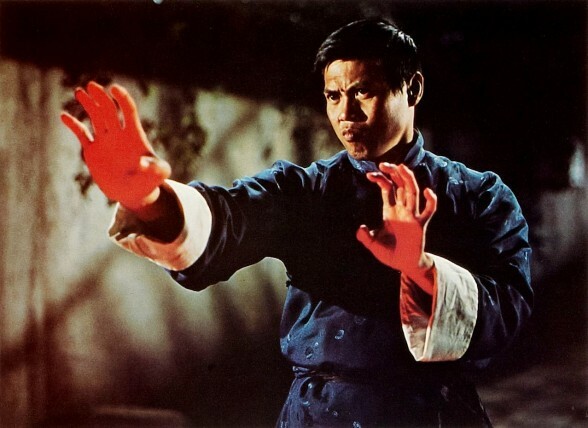 Overall: “Five Fingers of Death” is an excellent example of 1970’s kung fu, even with its imperfections.